Circumstances have conspired lately in both positive and negative ways to derail my intended schedule of posts here. No excuses, just realities that are in some ways beyond my control. My father passed away on Tuesday, May 15, and I have been dealing with normal legal and logistical challenges since then. It may be awhile before that abates entirely. The emotional issues are there as well, and if you are so inclined you can read about them in this post on my Sense of Misplaced blog. I appreciate your understanding and respect. I also continue to devote more attention to Sense of Misplaced because I firmly believe the "bigger picture" impacts every aspect of my life, your life, and our society in general. We have to start thinking way outside the box and I believe my true calling is to help achieve that. Consequently, more content is being provided there at this time. Lastly, I am writing once again for my major client, for their Insectlopedia blog. The demand for content there is seasonal, so I have to write when the client requests it. My goal remains to write mostly during the winter so that I can be afield at this time of year, but we do not always get our way in the working world. I may have more exciting news to share in the coming weeks, so stay tuned. Thank you as always for your continued loyalty. After my presentation to the Austin Butterfly Forum last month, I opened the floor to questions from the membership. Three questions stood out, and I would like to share them here, along with perhaps more refined answers than I gave at the time. Meanwhile, I am always happy to entertain questions from my readers. Ask away! Q: You mentioned finding all these species new to your area. How do you figure that out, and how do you decide whether to make that public? Answer: I do not always know whether I have something significant or worthy of reporting, but I like to err on the side of a possible new discovery. Making an observation public helps in the verification process because more eyes, and often better-informed individuals, are looking at it. If someone shames you for posting a "common" species that you identified as something more rare, then that is on them, not you. If you are not posting [to iNaturalist or Bugguide.net for example], then you are not contributing to our collective knowledge. Everyone makes mistakes, and if you are not, then you are not learning, as well as not contributing. There is always a risk of looking stupid, but it is never wrong to put something out there (I then shared my own misidentification of a Mexican Silverspot butterfly that turned out to be much more exciting and significant than posting what I thought at the time was "merely" a Gulf Fritillary). While I normally have a better-than-average idea of what is supposed to occur where, I am as vulnerable as the next person to making mistakes or incorrect assumptions. It bruises your ego for a bit, but everyone is more informed in the long run. Q: Have you noticed a decline in insect populations, and if so what do you attribute that to? Do you think global warming is having an impact? Answer: Where I live we see great fluctuations in insect abundance and diversity from one year to the next, usually related to the amount of precipitation we receive, or lack thereof. The extreme swings of the weather pendulum seem to be something rather new, and would tend to lend credence to the idea that climate change is a real phenomenon. 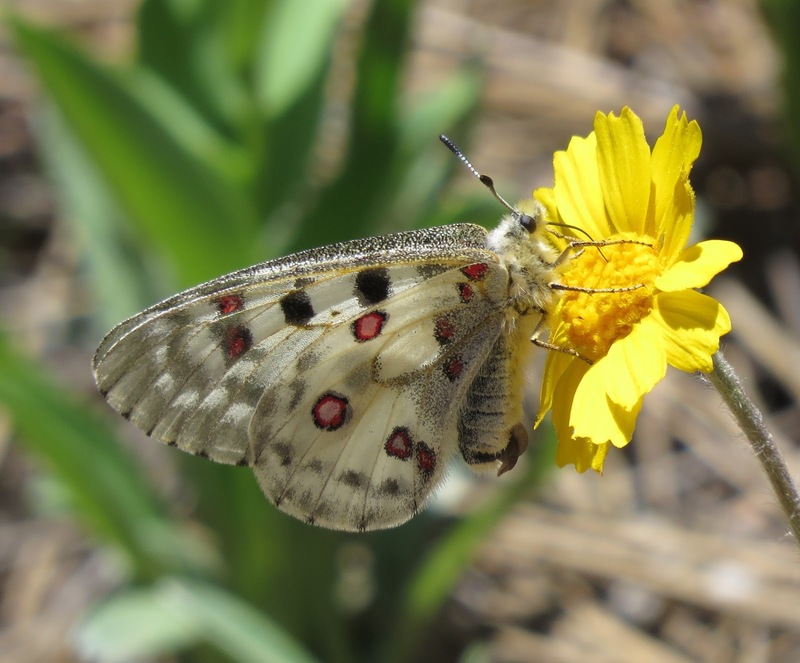 We are seeing more southerly species appearing in Colorado that we have not seen previously, or not as frequently. There have been scientific studies that show pretty conclusively that alpine species are dwindling in numbers as their high elevation habitat becomes too hot and inhospitable. I think there is no question that global warming is having an impact. Those whose occupations are in the fossil fuel industry may have another opinion. Q: What would you say is the most exciting place you have ever lived, or traveled to, for insects? Answer: That is a something of an unfair question [I was addressing folks in Austin, Texas and thought maybe that location was the answer he was looking for], but....I'm not sure that I can point to a particular geographic place. I think for me it is a matter of specific experiences, isolated encounters with animals that leave the most vivid impressions and that I can recall most intensely. It is not always an insect that figures into the picture, either. A couple days ago when we were at the Brackenridge Field Laboratory and we came across a coral snake, very suddenly, right in the middle of the road. Before we traveled here I had contemplated what kinds of potentially dangerous creatures we might stumble upon, and a coral snake was not even on my radar. I don't see snakes very often, anywhere, let alone one so colorful and venomous. That got my adrenaline pumping, and I will not soon forget the experience. 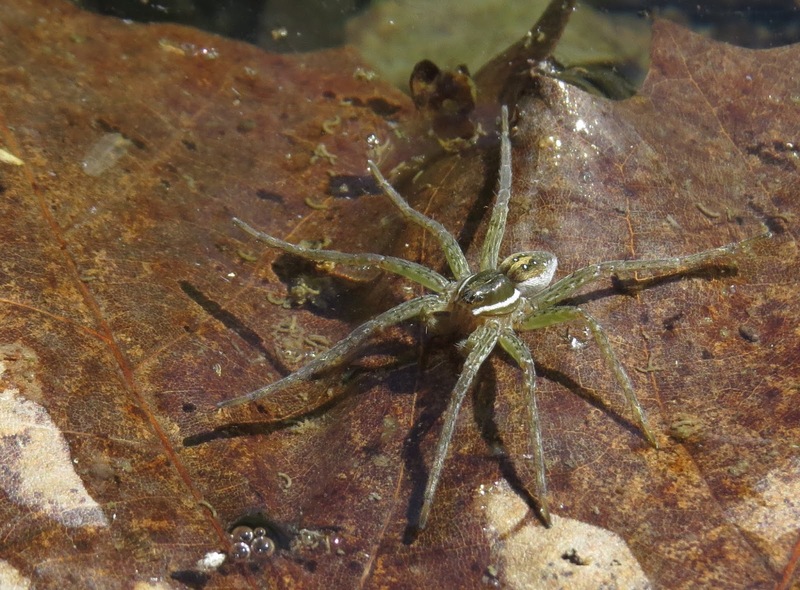 The short answer is that I can find wonderful creatures anywhere, from my backyard to a southern swamp. Yes, some places may be more exotic than others, but they are all what you make of them. Please feel free to share your own questions in comments and I will periodically make a blog post to answer them. 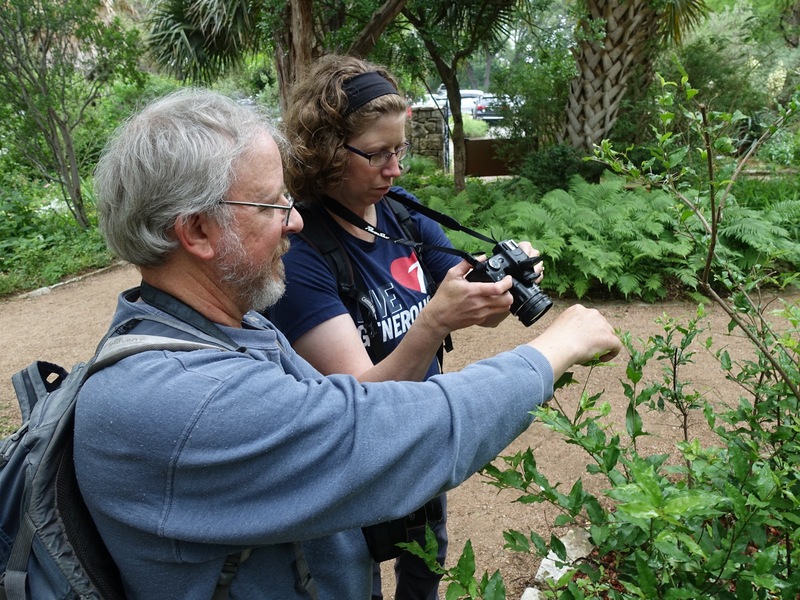 It was my honor to be invited to give a presentation and participate in "bug walks" with the Austin Butterfly Forum in Texas from April 22-24. Special thanks to Mike Quinn for extending the invitation, and to Dan and Linda Hardy for hosting Heidi and myself at their lovely home. We were fortunate to have agreeable weather there, though we left Colorado Springs with snow on the ground and returned to more flurries. The turnout for all of the scheduled events was impressive considering that we were looking for insects rather than birds. The Sunday outing included people who drove from as far as Houston to spend about half a day with us. The Monday evening meeting, held at the Zilker Botanical Garden, was likewise well attended, and select ABF members furnished refreshments. You do not go hungry or without entertainment in Austin, at least if the ABF has anything to say about it. Let us start from the beginning, though. 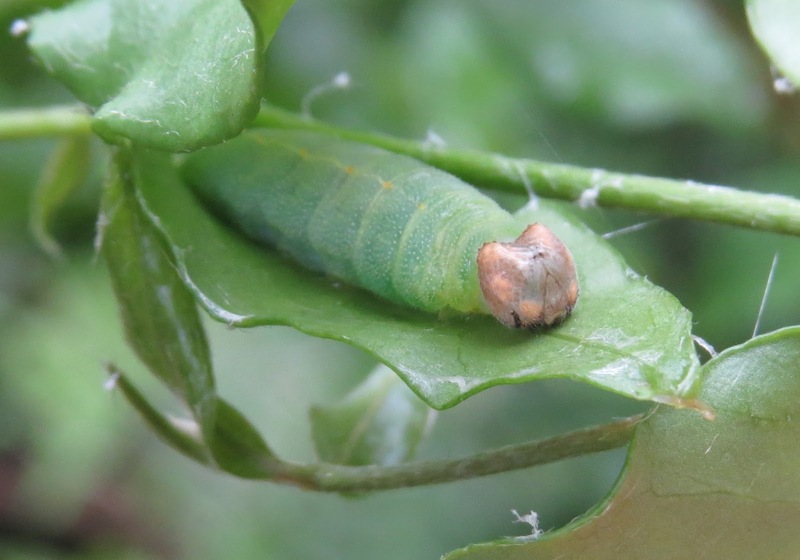 Duskywing skipper caterpillar in leaf "sandwich"
Heidi and I arrived early afternoon on April 21, and Mike Quinn whisked us off for some vittles at Threadgill's, an Austin landmark packed with music memorabilia of rock and country genres. The weather was humid with intermittent drizzle, but we went to visit the Zilker Botanical Garden anyway. This lush park is full of all manner of native and exotic plants, landscaped in a manner that was bird- and bug-friendly. We found several caterpillars, true bugs, beetles, and butterflies despite the overcast skies. We then went next door to the Austin Nature and Science Center and the Zilker Nature Preserve behind it. 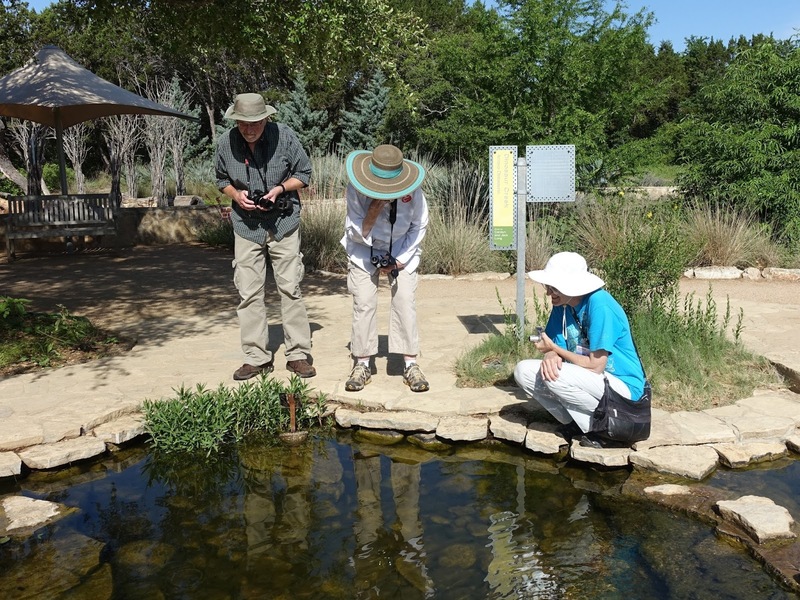 We quickly spotted a Diamondback Watersnake digesting a recent meal on an island in a small pond. 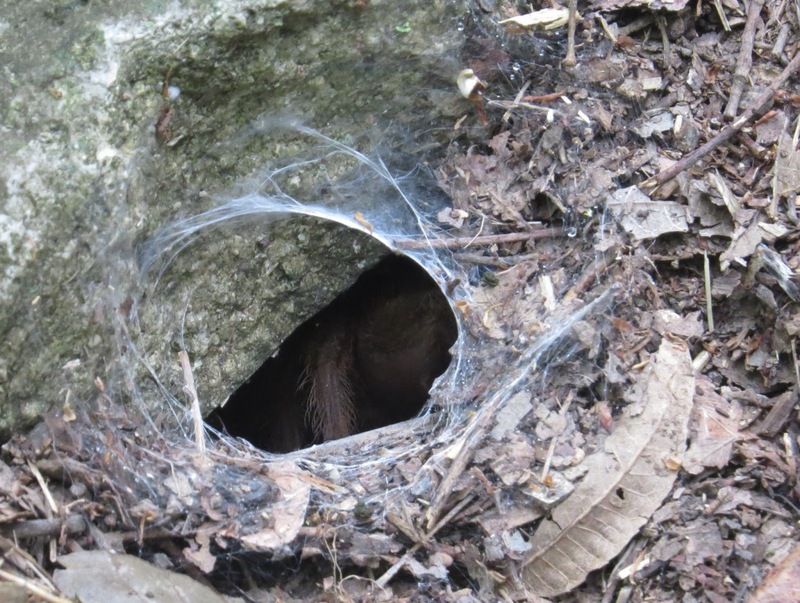 One of the naturalists who was leaving for the day described a vireo nest in the preserve, and sure enough we were able to locate that, too, but not before finding a tarantula in her silk-lined lair. The vireo nest looked like it was holding a recently-hatched Brown-headed Cowbird, much to our disappointment. By now we were killing time until the famous bat flight from beneath the Congress Avenue bridge in downtown Austin. 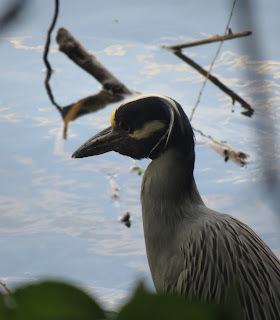 Walking along the river we found a few more birds, including a Yellow-crowned Night-heron stalking the shady shore. 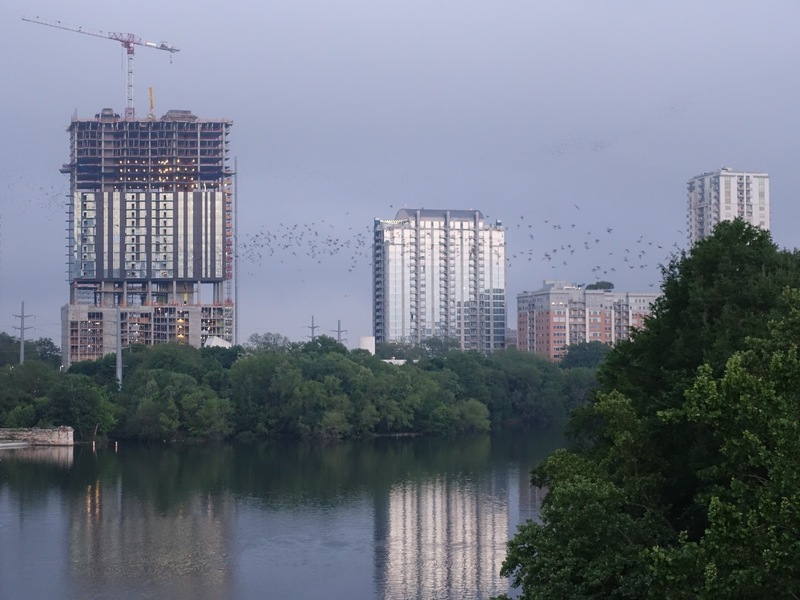 After a quick bite at Freebirds World Burrito, we were ready to witness the spectacle of over 500,000 Brazilian Free-tailed Bats exiting their haunts from beneath the bridge. We were not disappointed. About twenty minutes after sunset, they started streaming from the southern end of the bridge, followed eventually by others farther north. Please go see it for yourself, from both the bridge and from a boat or kayak. There are even commercial boat cruises specifically for this purpose. 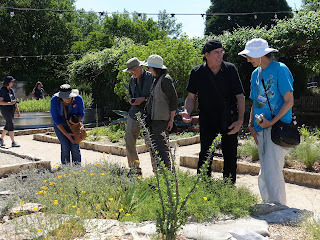 Sunday morning we convened with other members of Austin Butterfly Forum at Brackenridge Field Laboratory. Several buildings, greenhouses, and uncovered water tanks occupy the property, but there are also acres of undeveloped property that we prowled for insects. 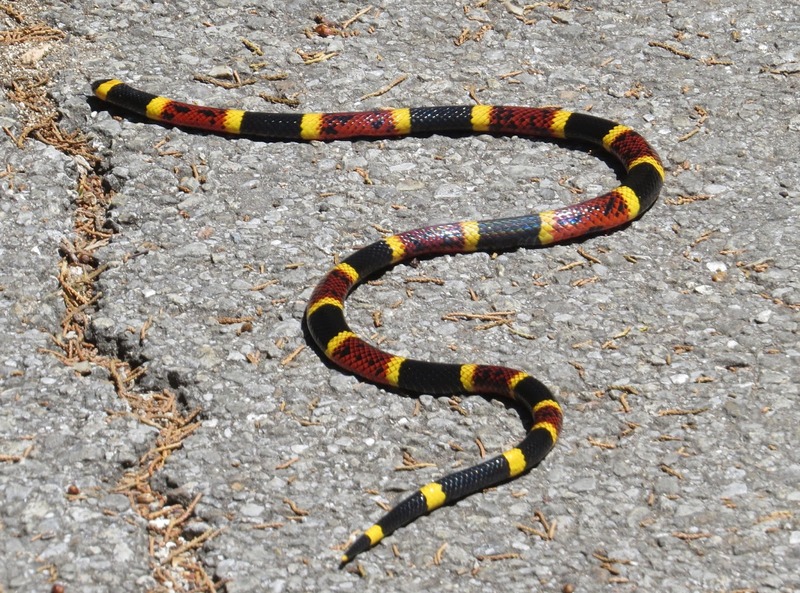 The most startling and exciting organism we encountered was a coral snake, right on a paved path. After a pizza lunch delivery, we toured the insect collection, a sizeable holding of preserved specimens. They had just received a donation of butterfly and moth specimens that have yet to be integrated into the larger collection. Lastly, we looked in on a greenhouse containing live tropical longwing butterflies (Heliconius and related genera). 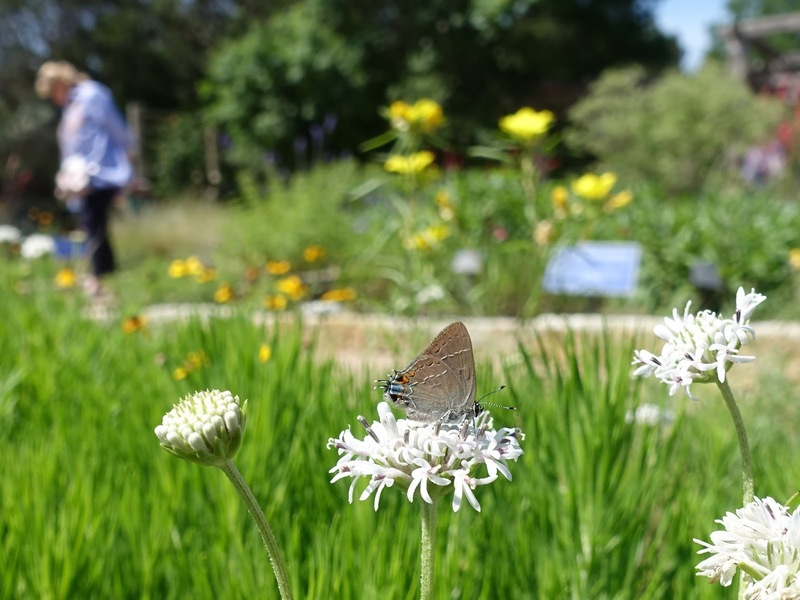 It was much like the commercial butterfly houses one pays to visit, but with a scientific purpose to analyze genetic lineages in these insects. Some specimens were easily recognizable as a particular species, but others were obvious hybrids. After lunch, Heidi and I retired to our host's home, where I explored a greenbelt ravine behind their property. The "hill country" is crossed by streams that erode the limestone rock that gives the landscape its topography. Live oak is the dominant tree, but there is a good diversity of vegetation. 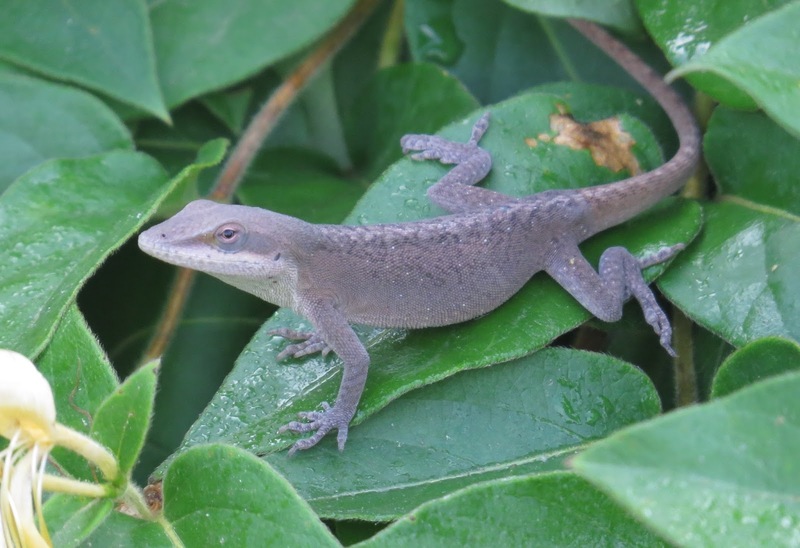 It is a distinctly arid habitat, but southerly enough in latitude to get animals like anole lizards and, unfortunately, fire ants. Monday morning found us strolling along the Barton Creek Greenbelt Trail, west from the Barton Springs Municipal Pool, a popular swimming hole. There were plenty of butterflies and other insects to be seen, including the ever-present Southern Dogface, Pipevine Swallowtail, and Gulf Fritillary. 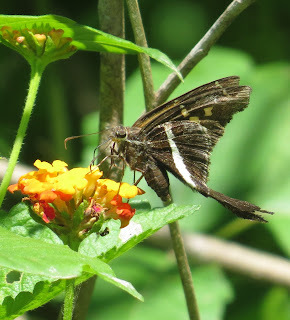 We did manage a splendid White-striped Longtail skipper, which was only the second specimen I'd ever seen. 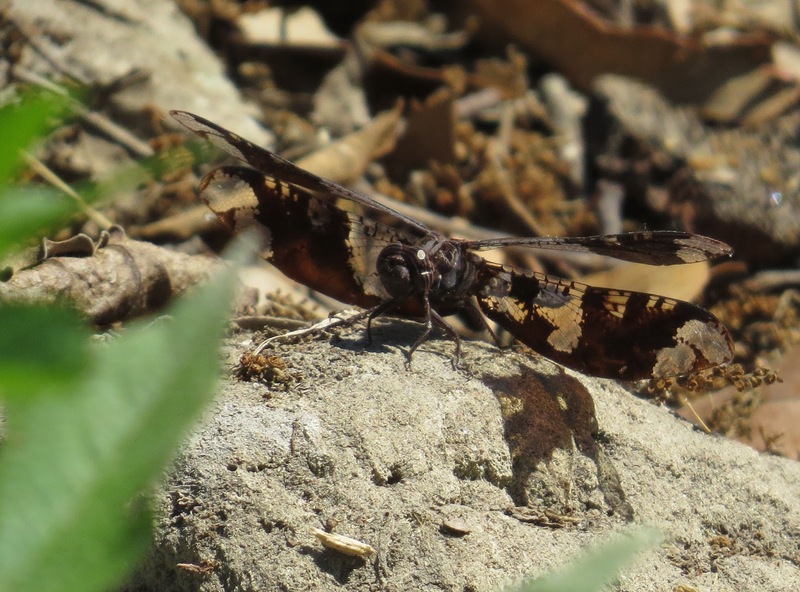 We were eventually able to access the nearly dry creekbed, where Heidi spied a local rarity: a Filigree Skimmer dragonfly. There were a handful of other dragonflies, and many damselflies, too. Heidi also pointed out a couple of Six-spotted Fishing Spiders waiting in ambush at the edge of one of the puddles now making up Barton Creek. 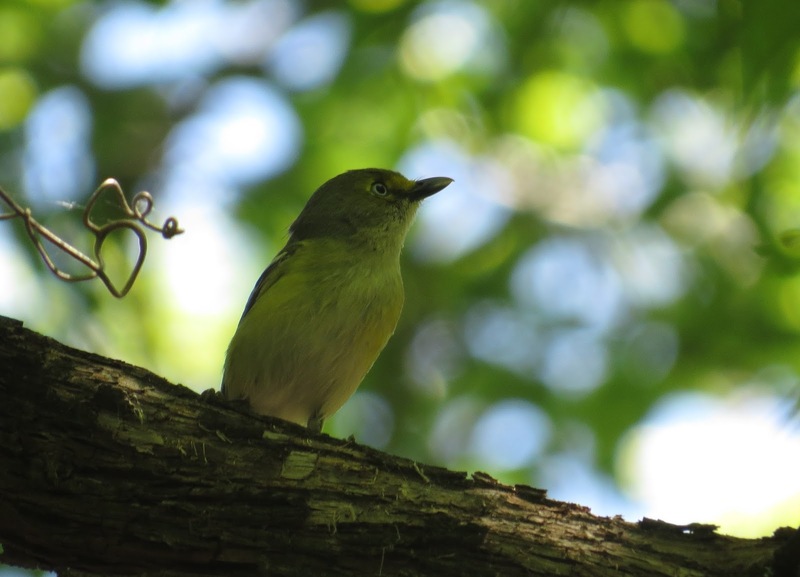 The riparian trees are full of birds, and we got to see a White-eyed Vireo collecting spider silk to line its nest. 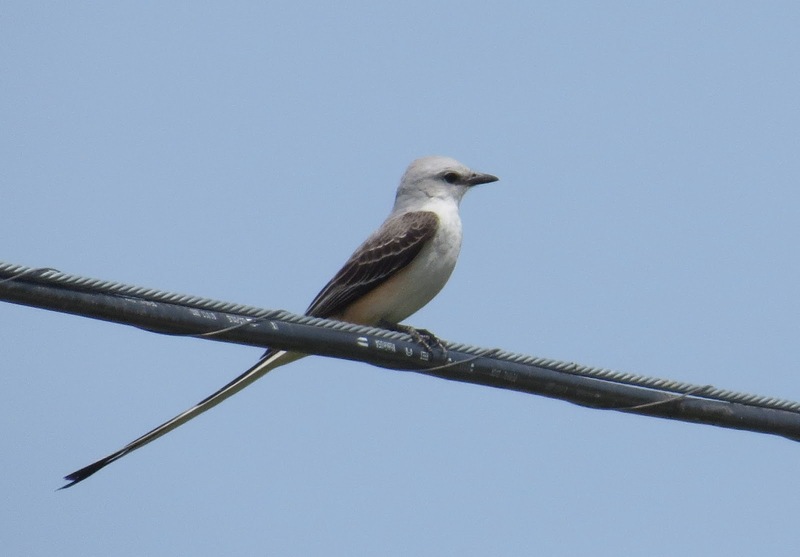 Northern Cardinal, Northern Mockingbird, and Great-tailed Grackles were among the most obvious birds here and within Austin as a whole, at least during our brief visit. Between lunch and dinner I did a bit of exploring in Dan and Linda Hardy's backyard, which is mostly wild, native vegetation and the occasional deliberately installed plant, like "Antelope Horns," a type of milkweed. As luck would have it, it was in partial bloom, and crowded with three Gray Hairstreak butterflies and one gorgeous green Juniper Hairstreak. A Springtime Darner dragonfly eluded my attempts to get its picture, and the large, red paper wasps were almost equally good at hiding as they hunted for other insects. 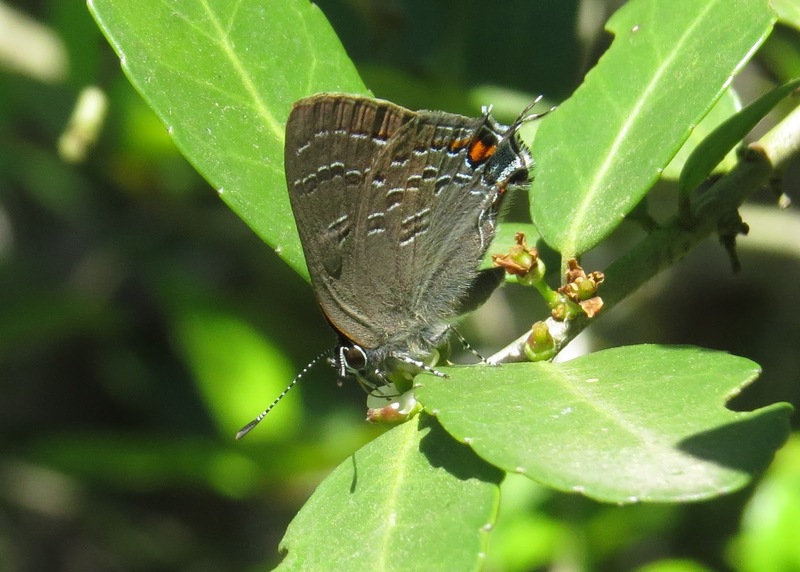 I was, however, able to repay our host's hospitality, at least in part, by recording the first Banded Hairstreak butterfly in his yard. I hope he has since been able to find one for himself. My after dinner presentation "Beyond Birds: the Joys of Bugwatching" was apparently well received, and afterwards I signed copies of the Kaufman Field Guide to Insects of North America for several appreciative folks. 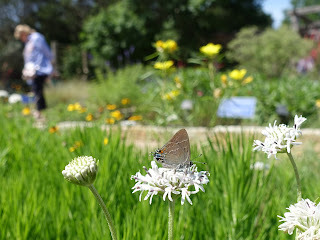 Tuesday morning found us at the Lady Bird Johnson Wildflower Center, an epic tribute to Texas flora on 284 acres. 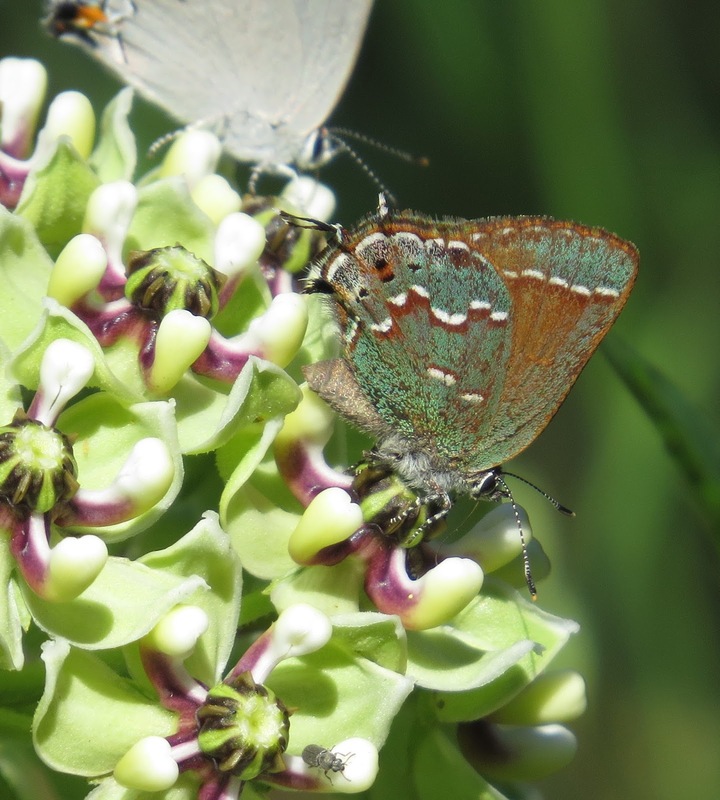 There is an ongoing invertebrate survey that has, to date, recorded 93 species of butterflies alone at the site. 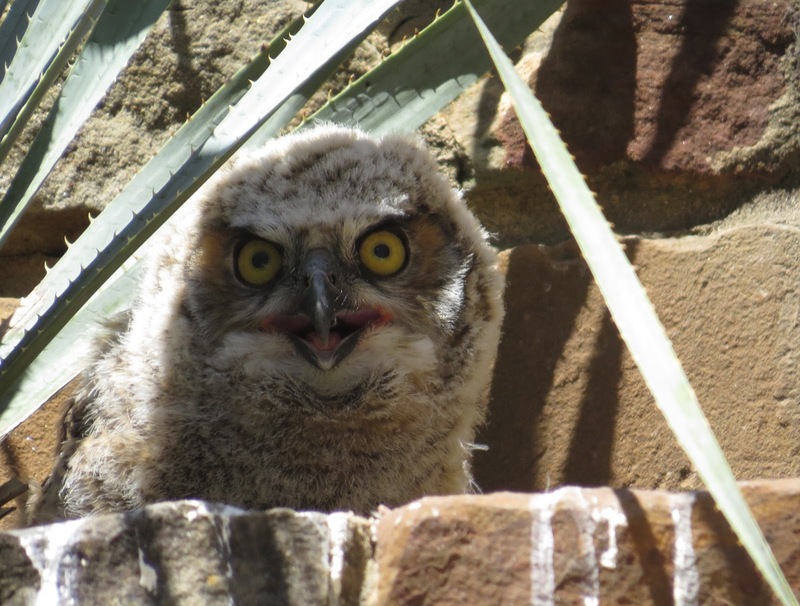 All wildlife is welcome, and our particular visit coincided with the presence of fledgling Great Horned Owls right at the entrance to the whole park. 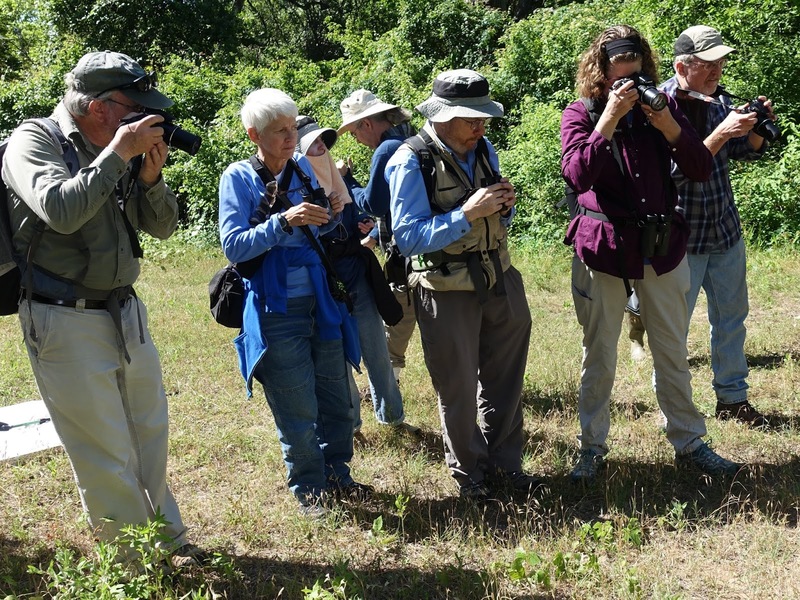 After lunch, before our departing flight, Mike took us to Hornsby Bend, a wastewater treatment and research facility that includes large retention ponds frequented by birds and other wildlife. We saw many shorebirds there, as well as Painted Bunting and, finally, a pair of Scissor-tailed Flycatchers as we were exiting. It was a fine conclusion to an exciting, memory-filled trip. Thanks again to everyone who made it possible.